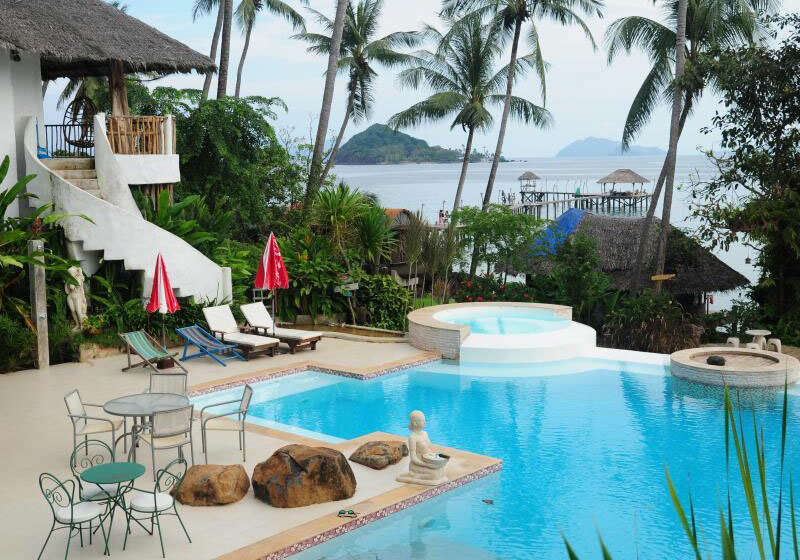 The prominent point of CoCoCape Resort is a long pier lying down to the sea. We provide our guests deck chairs for those who love sun bath or lie leisurely with their favorite books. Here, the guests can enjoy fresh air and clear sea water with fish visibility swimming back and forth as if they want to greet and willing to provide entertainment to our guests. Likewise,our guests can also enjoy water sports e.g. skin diving, scuba diving, kayak etc. There are groups of corals and fish lying 200 meters away from the pier. The guests may kayak to Koh Kham and Koh Pee also. Focusing on evening and night atmospheres, our guests can enjoy the scenery of sunset goes out of sight then later observe twinkling stars over the sky at night time. Short Description: Azure sky, crystal clear sea, white sandy beach with lazy coconut trees swaying to the rhythm of the wind, you are at Koh Mak Cococape Resort, your private world.